You definitely have to try this one! A traditional and probably the most famous, Philippine dessert, this sweet treat contains all the fixins’. 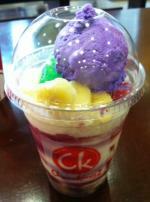 Depending on, who makes it, Halo-Halo can always be made with different ingredients. ChowKing’s usually contains the following: sugar palm seeds, jackfruit, white beans, coconut, red mongo beans, plantains, ube (purple yam) jam, crème caramel custard, and ice cream! And then of course, your shaved ice , evaporated and condensed milk. All of the ingredients are layered. It’s up to you if you would like to mix them all up. I know it sounds pretty overwhelming, but it is truly a taste you will have to experience! This is my go-to fave! This Frapp is a refreshing blend of sweetened Matcha green tea, milk and ice and topped with whipped cream. It’s not too sweet, but just right to satisfy your craving. If you still have a sweet tooth, add a chocolate cookie straw to finish it with a sweet crunch. This one is pretty hard to describe. Like with all my suggestions, you will just have to taste it to truly enjoy it! It’s creamy, a bit calming, and of course, it shares a touch of sweetness. If you don’t know what Taro is, it is actually a root vegetable, but how it’s blended with milk, coconut, and sweetener, it tastes like ice cream; delicious ice cream. For all you chocolate lovers, this one is for you! This shake is literally blended with Godiva’s Chocolate Lava Cake Truffle – (dark chocolate liquid fondant with dark ganache inside a dark chocolate shell). Say that 10 times! It’s topped with fresh whipped cream and chocolate drizzle. Dark, rich, and so very chocolatey! I know. You’re probably thinking, avocado? As in guacamole, avocado? Yes! Fresh avocado, blended with milk, sweetener, and ice. It’s delicious! All I can say is give it a try. If you like a creamy-type of shake, this will definitely hit the spot! The texture is similar to the Green Tea Frapp (hence, why I love this one so much, too)!